Incredibly stylish, this handcrafted bar stool also fits perfectly in any space. Whether in the kitchen, an indoor hallway, or in your game room, this bar stool is a direct fit for your interior design situation. 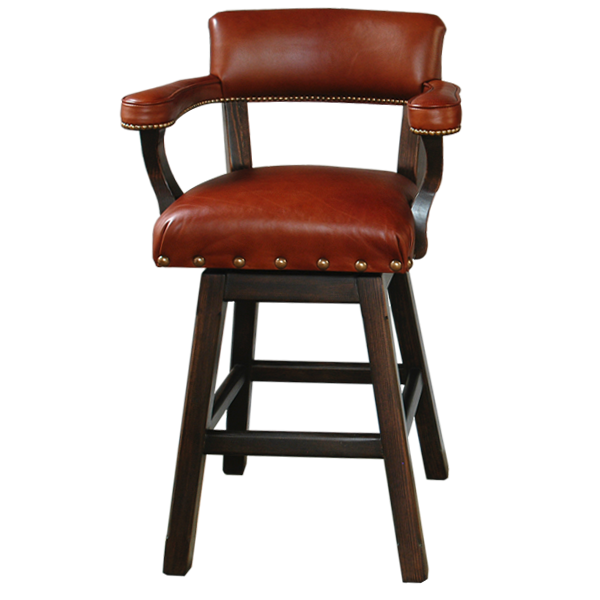 The seat, seat back, and armrest of this beautiful bar stool are upholstered in rich red colored full grain leather, but you have the option of customizing your bar stool by choosing different kinds of full grain leather or fine fabric. Our bar stools are built to last for generations, as the custom wood frame is made from the best quality wood available, and the full grain leather upholstery is hand tacked with the greatest care. This beautifully finished bar stool has splayed legs joined by a midway box stretcher. The bar stool swivels 180° and is 100% customizable.